for the stitchmarkers swap, we had 2 partners. 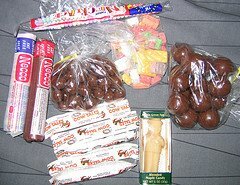 This swap came from Michelle who lives in Wa. this is what I sent for the "Have you any wool?" swap. This went to Jen in Ma. this is what I received from my "Have you any wool?" swap. This came from Deborah in New Jersey. this is what I received from the Magic yarn ball swap. It was sent by Maylin who lives in France. This is the assorted candy swap I received from Jessica who lives in Ma. this is what I received from the Knitting & Assorted Swap. It came from Jen who lives in Ma. I love soft wool (must be at least 50% wool) and I like 100% cotton. No mohair or acrylic please. 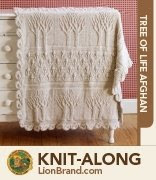 I have been knitting now for 5 years. A friend taught me. I would say that I am intermediate. I sew. I do needle felting. Papercutting. I don't spin. I like soft rock. Linda Rondstat, Sheryl Crow, Fleetwood Mac. Yes my computer plays MP3s. My favorite colors are red, maroon, very dark pumpkin orange,rust, dark/light gray. I don't like yellows, peach, greens,black. I am 34 with 3 daughters ages 8, 10, 18. Married for 12 years to a sweet man. No pets due to allergies. I love to knit things for my kids. I knit them hats, sweaters, legwarmers. 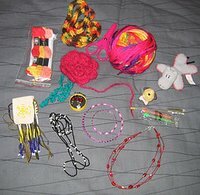 A few gifts to give as part of my swaps thru swat-bot. I also have a new grandson so I'm knitting him a sweater. Lots of knitting projects going on as usual. Absolutely. Especially simple things as I am a simple natural person. 2 years...a pinwheel baby blanket. I stopped knitting it when I had my miscarriage. I don't have one in particular but I like Christmas because I am able to give my knitted items as gifts to my family. I collect amethyst stones, miniature items that resemble real life, needle felting figures. 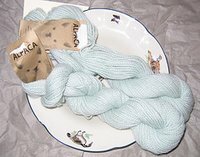 I would love to have some very lovely extremely soft alpaca yarn. 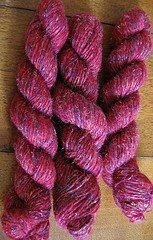 Hand dyed wool is wonderful too. I think I get most of the knitting magazine subscriptions. or 8.5 inches for sock measurements.